Butler's Jenna Kunst drives the ball on Allderdice defender Mackenzie Thompson during the Golden Tornado's 52-44 victory in the first round of the Butler Christmas Tournament. BUTLER TWP — Butler was able to create separation due to simple execution. The Golden Tornado girls basketball team shot just 31 percent (9-of-29) from the floor in the first half, which ended in a 25-25 stalemate with Allderdice. Butler was much more efficient in the final two quarters, making 47 percent (9-of-19) of its attempts in a 52-44 victory in the first night of the Butler Christmas Tournament. The result will lead to an all-Butler County final as Butler will face Knoch, a 49-41 winner over Indiana, in the championship game at 6:30 p.m. Thursday. 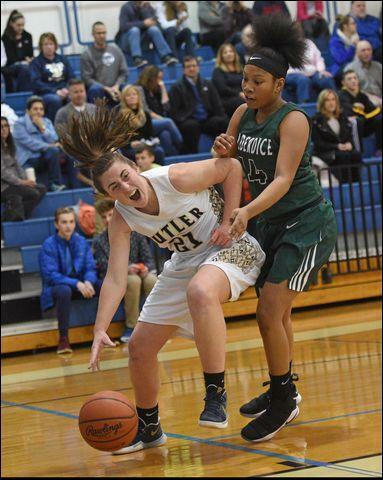 Senior forward Alyssa Eyth was the catalyst for Butler. With teammate and fellow frontcourt standout Jenna Kunst on the bench with foul trouble for much of the game, Eyth stepped to the fore. With Allderdice holding several slim leads between two and five points in the second quarter, Eyth was a major reason the Tornado were able to pull even by halftime, scoring 14 points in the second quarter alone. Eyth finished the game with a double-double of 22 points, 11 rebounds and added six steals. Butler opened the second half with an 8-0 run, with 3-pointers from Nicole Pepmeyer and Emilee Altman sandwiched around a bucket from Kunst, who had re-entered the game. When Eyth drained a pair of free throws with two minutes remaining in the third period, Butler had tied its largest lead of the game at 40-30. The Dragons, however, closed the period with a modest 5-0 run, including a conventional 3-point play from Emma Waite, and trailed just 40-35 with eight minutes to play. But a second 8-0 run from Butler pushed its edge to 48-35. The spurt included treys from Jordan Kauffman and Kunst and a basket inside from Eyth. Outside shooting helped keep the Dragons (2-5) ahead for much of the first half as the team connected on five 3-pointers in the first two periods. For the game, Allderdice was 8-of-13 from beyond the arc. Waite and Sophia North both made three. “They play a lot of sophomores, but they're a pretty good team,” Maier said. Kunst added 13 points and five rebounds in her limited time on the floor. Butler (4-3) will attempt to win its fourth straight game, and grab the title at its own tournament, against Knoch Thursday. Allderdice coach Ellen Gilliard was unavailable for comment. Markaya Killer 2 0-0 6, Emma Waite 7 1-1 18, Sophia North 4 0-0 11, Brooklyn Jones 2 0-0 4, Keira Coleman 1 2-3 4, Nautica Burwell 0 1-2 1, Mackenzie Thompson 0 0-0 0. Totals: 16 4-6 44. Nicole Pepmeyer 1 0-0 3, Alyssa Eyth 7 8-10 22, Jordan Kauffman 2 0-0 5, Jenna Kunst 5 2-3 13, Julia Gibson 1 1-2 3, Emilee Altman 2 0-0 6, Mia Rader 0 0-2 0, Emma Monteleone 0 0-0 0, Sydney Hanratty 0 0-0 0, Morgan Gage 0 0-0 0, Heidi Gross 0 0-0 0. Totals: 18 11-17 52. 3-point goals: Allderdice 8 (Waite 3, North 3, Killer 2); Butler 5 (E. Altman 2, Kunst, Kauffman, Pepmeyer).